When PRM Encouragement becomes PRM Enforcement? One specific issue raised by the DoT was that in some of the complaint files inspected, the airline involved “simply states that the responsibility of providing disability assistance is on the airport authority and ………. has forwarded the complaints to the airport authority for response”. 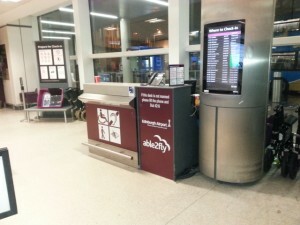 In mitigation, the airline claimed that it “frequently must depend on outside vendors not subject to its direct control when assisting passengers having disabilities to navigate through airport terminals” and that “when responding to complaints filed by passengers assisted by these vendors, it relies on those vendors to explain the factual circumstances surrounding passenger complaints in order to provide timely dispositive responses”. – how prepared are we on this side of the Atlantic? – what rules apply to complaint handling? Currently the NEB’s (National Enforcement Bodies) seem to be encouraging “best practice” approach but with PRM numbers growing rapidly, how long before encouragement becomes enforcement and will that enforcement fall on the airlines (who usually receive the complaints) or on the airports (who are responsible for the service)? It won’t be an acceptable defence to issue the usual statement that an organisation “takes seriously its responsibilities and obligations” with regard to PRMs. Neither will it be possible to pass on the ownership of the problem to a 3rd party contractor – the letter from your local NEB won’t land on their desk. Let’s try to offer some ideas for making sure your organisation is well prepared. e) all the above is supported by a Management Review process and appropriate staff training. Airports already have management systems in place for Safety and Quality, it’s just a case of applying similar thinking to the PRM Management system.